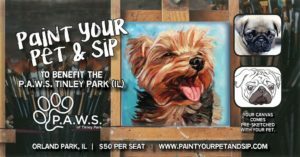 Paint Your Pet & Sip - P.A.W.S. Aided by fun-loving instructors at Trina Mae Studio, create an original masterpiece of your pet, all while enjoying food and drinks! 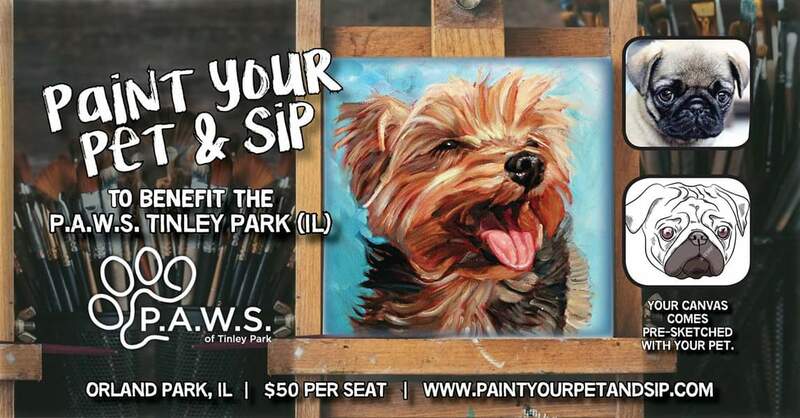 Whether you have a cat, dog, bird, or lizard- come join us as we paint masterpieces of our pets while supporting a great cause. One pet per canvas. All skill levels are welcome! 4. $15 of every ticket donated to PAWS Tinley Park. The People’s Animal Welfare Society of Tinley Park is a no-kill animal shelter dedicated to the protection of domestic animals, and to the attempt to prevent animal cruelty in the surrounding communities. -No outside food or drinks. Minimum one drink or food purchase per guest.